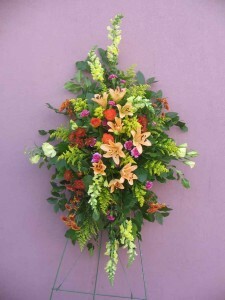 A very lush standing spray with flowers in late summer colors. The addition of the bright orange roses and orchid colored mini carnations add spark to the deep yellows and rusts of this display. 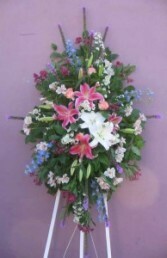 We've used snapdragons, Asiatic lilies, chrysanthemums, lisianthus, solidago and mini carnations. Beautiful in white and green. We've placed this design on our white wooden easel, for an added touch. If you would prefer, this lovely design may be made in any color combination you choose. 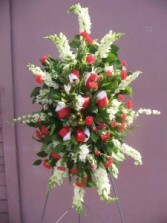 A wonderfully traditional red and white standing spray of snapdragons, larkspur, mini carnations and hypericum. We've added red and white ribbon loops to emphasize this color combination. Truly a favorite. The graceful lines of this contemporary standing spray are simply elegant. The play of color between the gerbera daisies, and red ginger are toned toned down by the lovely purples and lavender of the dendrobium orchids and lisianthus. 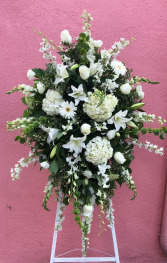 The use of all white flowers is a very preferred piece for a funeral, the monochromatic theme lends elegance and stateliness. We've used an assortment of green flowers also to add interest and texture, bells of Ireland and verbena compliment the whites of the hydrangea, lilies and snapdragons. A striking arrangement in primary colors. 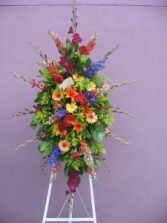 This spray includes gerbera daisies, deep blue delphinium, lilies, snapdragons and gladiolas. A whole garden full of wonderful flowers are displayed here on one of our whitewashed wooden easels. While this piece is shown in more feminine colors, the design can easily be created in the colors of your choice. 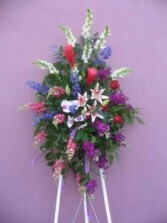 This wonderful tribute has a mixture of daisies, lilies and gladiolas. 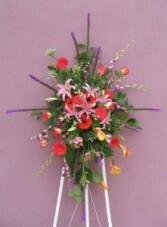 Gladiolas are not always available here, however we will use an equally beautiful spike flowers in it's place. As always this spray and all the others can be fashioned using whichever colors you'd prefer. This lovely standing spray is in shades of pink and lavender. 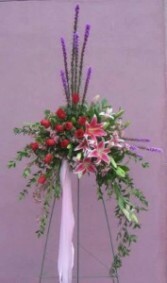 We've used stargazer lilies, deep pink roses, and pink and lavender stock to set the color theme. 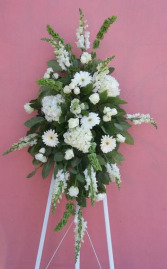 It's softened with seeded eucalyptus and limonium and set upon one of our stately ,white wooden easels. 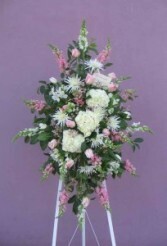 A beautiful tribute in the pastel shades of pinks and whites. A touching display to offer your condolences. Send along your best wishes with this handsome spray. 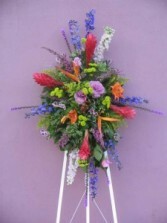 A garden full of lilies, delphinium, alstroemeria, liatris, roses and aster are combined and shown on our white wooden easel. Call and ask about availability. This is a beautiful, colorful and airy spray. 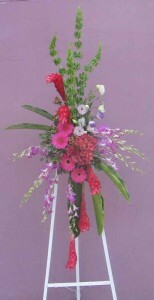 The deeper colors of red and orange in the gerbera daisies, ajnd roses add depth, while the bright purple dendrobium orchids, liatris and golden calla lilies add movement. This stunning standing spray is filled to the brim with bright tropicals and garden flowers. 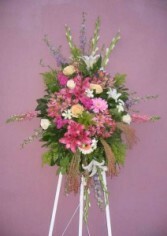 A stunning, spring colored spray, in jewel tones of pink, blue and purple. 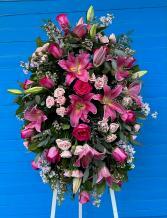 Let this beautiful design convey your condolences. 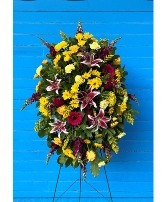 A beautifully bright and sunny standing spray is perfect for celebrating a wonderful life. 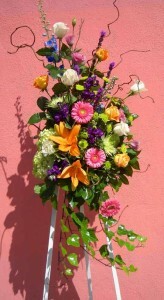 This stand includes many different garden type flowers, the colors and types can be changed however you'd like.